THIS HAS A LIGHT IN THE TOP INSIDE, BUT THIS IS NOT MADE TO HEAT OR COOK FOOD, ONLY DISPLAY FOOD. 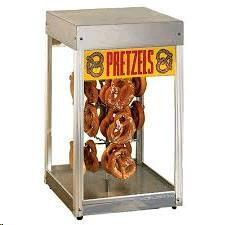 * Please call us for any questions on our display pretzel rentals in Vinton VA, Roanoke, Botetourt, Bedford, & Smith Mtn. Lake.